Dunmore Cave is described in folklore as the mouth of a huge beast, with ten thousand teeth above his head and as many under his feet. The huge, imposing entrance, has been known for centuries, but it is only comparatively recently that it has been fully explored. Until the seventeenth century caves were regarded with dread and awe as being entrances to Hell. 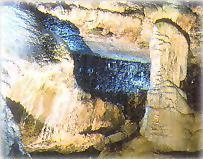 From the eighteenth century onwards a number of visitors, including scientists and historians, have written about the cave. Research on geological and historical aspects of the cave has been pursued making it one of the best documented cave sites in Europe. 11 Km from the Kilkenny city on the Castlecomer Road (not in Dunmore Village). Dunmore Cave is a well developed show cave and consists of a series of chambers. An exhibition centre, guide service, steps, cat-walks and lighting. Admission is by guided tour only.